IF YOU ARE LOOKING for a play that takes on some powerful relationship taboos, you should really see ‘Borders in a Bedroom’. Debuting in the UK at the Camden Fringe Festival on Tuesday (August 8) and running until Saturday (12) at the central London theatre Tristan Bates Theatre, it’s written and stars Shivali Bhammer in what is a two-hander. Now based in New York (and where the play premiered during the Tamasha Festival in her adopted home city in autumn last year), the London-born Bhammer is best known in the UK as a bhajan (Hindu devotional songs) singer, releasing two albums. 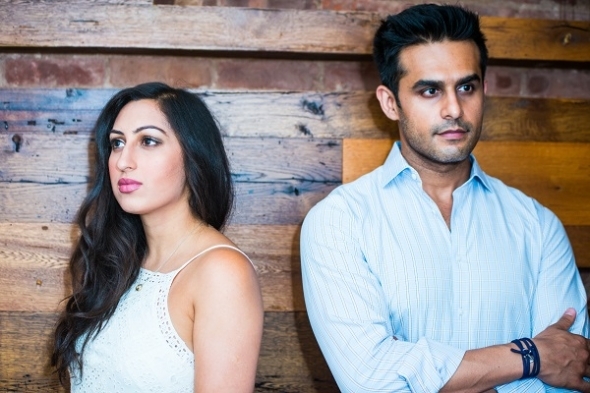 The play, which won three awards, including best production* and best playwright at the above drama festival, has at the heart of it a couple – a British Hindu woman and a Muslim American man who are living together – two taboos right there and the British-American divide gets a look-in too. ‘Borders in A Bedroom’ is both her first fully fledged play an actor, and as a playwright. The drama unfolds as the couple ‘Maya’ (played by Bhammer herself) and ‘Imran’ (Shez Sardar) prepare to celebrate her birthday with a few friends over for dinner at their New York apartment. Their conversation is punctuated by a series of BBC radio news reports – which cover very common territory and spark a series of comic verbal skirmishes that reveal deeper-seated tensions. Funny though it might be – Bhammer was also keen to address forms of prejudice within the South Asian community. Bhammer said she also wanted to explore gender relations more generally in the age of dating apps such as Tinder. She also looks at the social expectations of relationships and how it is assumed all women want children, when that isn’t the case. “You don’t hear that being said in public,” posited the former City finance executive, who is now focusing on her creative career. While friends and family have been very supportive, they worry about how Bhammer will be perceived (in the wider community – now that is very South Asian). She said the play is not written from that personal a perspective and is more motivated by questions and debates she thinks are not being aired or discussed and stresses that it isn’t intense or heavy, but essentially a comic drama about two people drawn to each other but slightly misfiring. When the play premiered in New York and won awards for Sardar as best actor, Bhammer was approached by people, who said the play really spoke to them. “I had a 30-something Jewish woman come to me and say she was coming back with her boyfriend because it was so close to her own relationship and the issues they had – and I had a Hindu man tell me he split up from his Muslim girlfriend because she wanted him to convert to be married. While it’s Bhammer’s first play as actor, her male lead Sardar, who is of Indian origin, is well-known on South Asian TV in the US. The play is produced by a company Bhammer helped to found – Conscious Stream Productions. www.asianculturevulture.com. has not seen the play. ‘Borders in a bedroom’ August 8- Saturday 12 9.15pm Tristan Bates Theatre, 1a Tower Street, Covent Garden, London WC2H 9NP.